(I spent over a year researching this and gathering stories from former presenters for this posting. I learned a long time ago not to ask current employees about this phenomena, for it is something that is downplayed. I ask any visitor to Greenfield Village to please refrain from asking presenters for such stories. I do not want to cause 'another' problem by having dozens of people pestering the workers, and then having management notify me. I once did a posting entitled "Do You Believe in Ghosts?" telling of my own personal experiences with the afterlife and asking if others may have had the same experiences. The greater majority of those who responded answered in the affirmative. And because of what I had seen and felt and heard, I definitely do believe in ghosts. Now, some may feel this is childish (childish while being in my 50s? I like that!) or silly or crazy. But I don't care what they think. I know what took place and that's all that matters. I'm not in full understanding of this phenomena, and I've heard many differing explanations, some possibly plausible, some I'm not so sure of. But the telling of ghost stories on Hallowe'en derives from both the Druids' belief that the ancestral dead arise on this night and the Christian directive to honor the souls of the departed at Hallowmas. It was only natural, then, at early American harvest time get-togethers, when the communities would gather for such harvest time activities as corn-husking parties, apple paring parties, sugar and sorghum making days, and even at thresherman dinner parties, that ghost stories would become an integral part of these autumn celebrations. Many American ghost stories evolved from actual superstitions and rituals practiced by those who lived in the British Isles. These tales of the ancestral dead were told and retold by the elders to a spellbound crowd, late at night, after all of the activities were done, when the moon was fully risen and the trees outside shook with the autumn wind. That's when people gathered around a fire and told one another tales of the silenced dead lying in graves nearby. Many times I've been in or around an old house and something has occurred to solidify a sense of "I'm not alone." Surprisingly, however, as often as I'm moving about the ancient structures of the nationally known historical open-air museum of Greenfield Village, I've had very little of this other-world activity happen to me personally. And I'm at the Village a lot. So I've gotten to know the place pretty darn well. Notice, however, that I did not say I didn't have any strange occurrences. I've just had very few. And nothing that was in-your-face scary or haunting like is seen on the 'haunting' shows on TV. My experiences were more along the lines of something making my hair stand on end and really strange feelings that, like I mentioned above, I wasn't alone even though there was no one else with me. For instance, while I was in the Firestone Barn walking through with camera in hand (always!) to see the sheep, I felt, without warning, the hair on my arms and the back of my neck stand straight up. I quickly glanced around but there was not another living soul there with me. "Living" being the key word here. The feeling didn't last more than a half minute before it dissipated, but it was there. 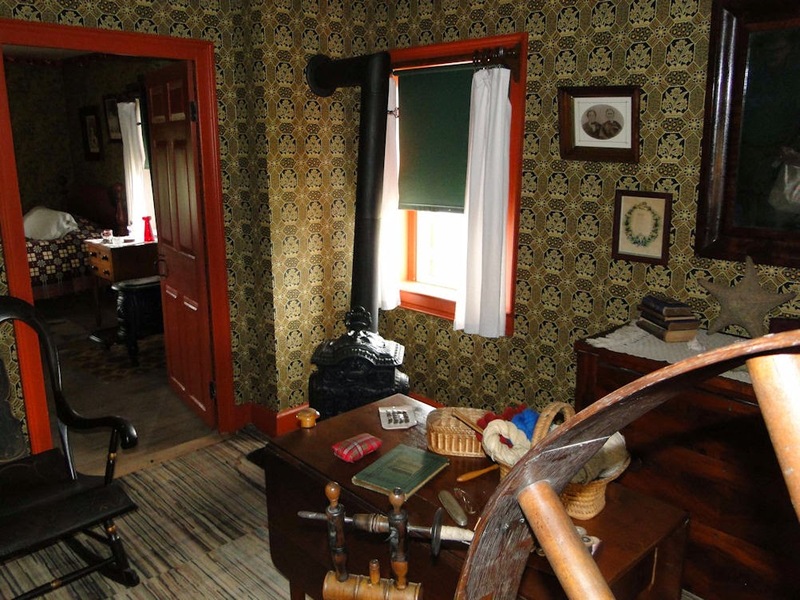 The Adams House has also given me the feeling of an other-wordly experience; while standing in the room to the right that leads directly to the kitchen - is that room called the sitting room? - I moved through and suddenly felt the need to stop because something that I could not see was there with me. There was a presenter in the house, but no other. I didn't say anything to her about what I felt, but the feeling stuck with me. By the way, both experiences here were not scary as if there was an evil force or anything. I did not feel the need to get out. It was just...well...there. Over the years I have befriended most of the historic presenters at the Village, including many who are no longer working there, and I've managed to acquire a fair amount of ghost stories and unusual happenings that have taken place on the grounds, including a few incidences documented in The Henry Ford's own research library. Even more recently, I asked a few others for some tales of the unknown that they might want to share. So I've gathered up some of the best and decided to have a little fun and maybe print some of the stories and experiences I've been told. The accounts you are about to read come from a variety of stories and sources - mainly former presenters written mostly in their own words. Be forewarned: do not expect to read horror stories like those found in books or on TV; the encounters I am presenting here are of a more personal nature. To me, it gives them a note of reality. I am presenting them house by house rather than by story teller, so each structure will have its own collection. Included with the haunted stories are brief histories of the homes. 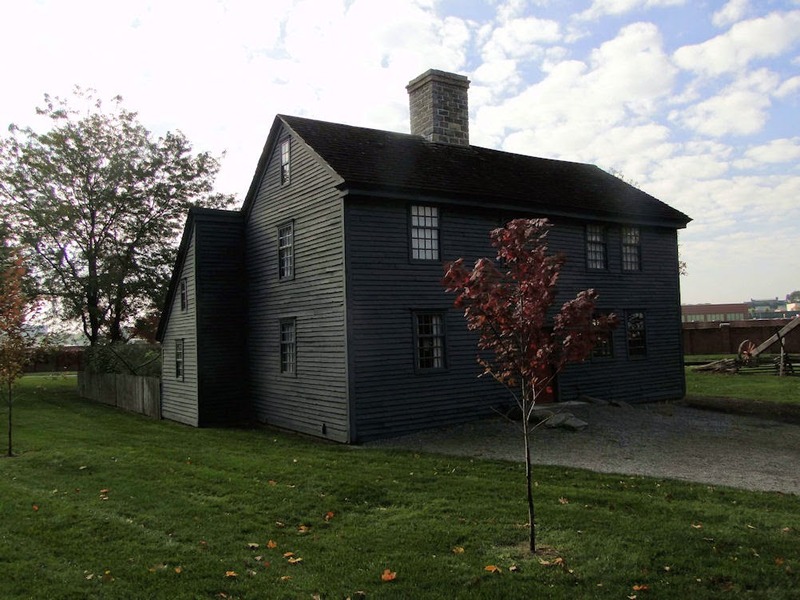 This former home of New Hampshire's first Secretary of State was originally built by John Giddings in Exeter, New Hampshire in 1751. Giddings was a prosperous merchant and shipbuilder who lived there with his wife, Mehetable, and their five children: Mary, Dorothy, Deborah, John, and Metetable. 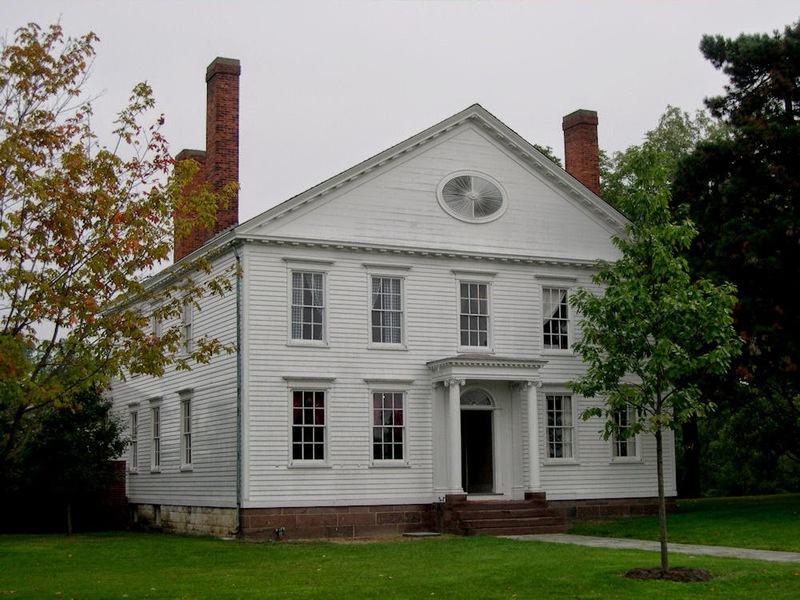 On December 22, 1790, it became the home of New Hampshire's first Secretary of State, Joseph Pearson, who, inside this house, married Captain Gidding's daughter, Dorothy, in April of 1795. In 1929 Henry Ford’s architect, Ed Cutler, found this beautiful example of a New England colonial home, though there had been numerous additions added years after its original construction. The house, brought to the Village in carefully numbered pieces in 1929, lay in a pile in the Village during the dedication ceremony, but was up by the summer of 1930. 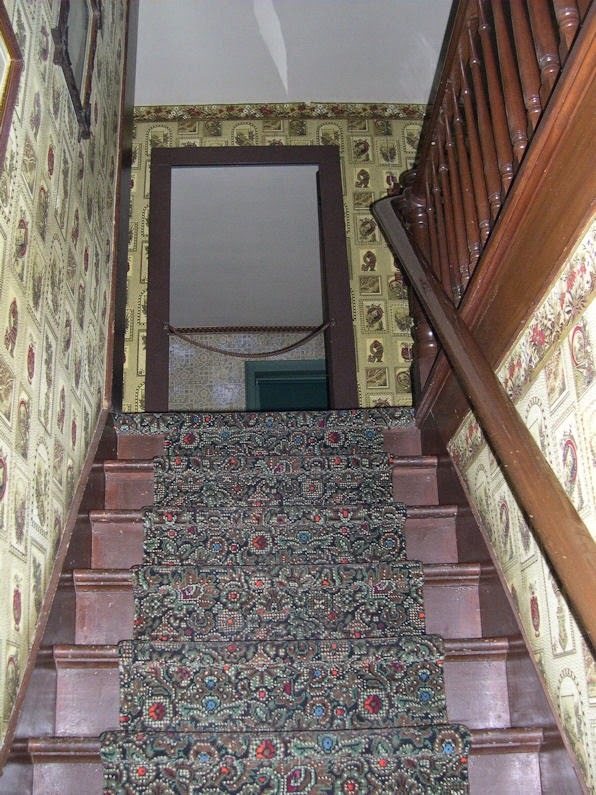 By studying its layout, Cutler restored it to what he believed to be its earliest condition, which included a secret staircase leading to the attic (this was also included in its Greenfield Village restoration). A house with this much history must certainly have some paranormal activity. "I was a presenter for five years then transferred to security and worked nights. The village takes on a whole new dimension at night. Doing driving patrols I stopped at Giddings to use the bathroom, which is located in the back. I walked inside and heard people talking but couldn’t make out the conversation; I thought it was the voice recorder that tells the history of the home. Was the conversation taking place in this room? I looked around and saw no one but felt a chill, and then I heard someone talking again. As I was leaving I then heard a voice clearly say, “He's leaving now,” and the full conversation started up once again. It was weird and spooky. No doubt the place is haunted." 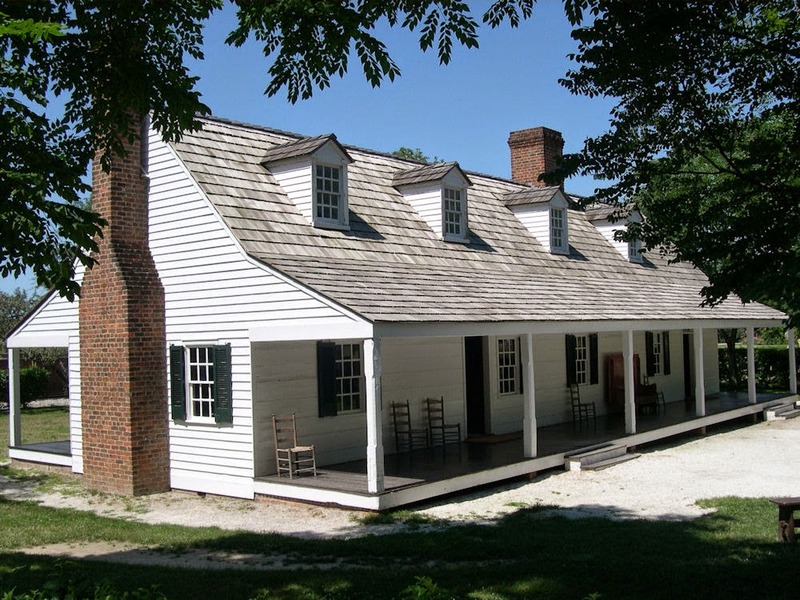 Henry and Elizabeth Carroll and their family built this house, known now as the Susquehanna Plantation, in the mid-1830's, where it sat upon 700 acres of land on the bluffs of the Patuxent River in the Tidewater region of Maryland. The Carroll's, who had five children, enjoyed a prosperous life, including hosting extravagant parties. Their 75 slaves, however, did not enjoy the same good life; they slept in 13 small, wood shacks with dirt floors and were made to work brutal hours in the fields, especially during harvest time. The Carroll family was one of the wealthiest in St. Mary's County - the slaves alone, according to the 1860 census, were valued at $49,000. Among the slaves were skilled craftsmen, including blacksmiths, carpenters, coopers, shoemakers, and seamstresses. The Carroll's fed themselves and their slaves from the abundant crops grown on their land: wheat, corn, oats, as well as hay and tobacco. Farm animals, including pigs, sheep, chickens, oxen, horses, and mules were also part of the plantation. When Ford's architect Ed Cutler arrived to inspect it, the building was intact but run down. After viewing the drawings and photographs that Cutler brought back, Ford decided to acquire the home. The building was moved in March 1942 and erected by that following August. An interesting fact here is that it is situated exactly in the same position and direction in Greenfield Village as it had been in Maryland. Initially, Henry Ford believed the house was built in the mid-17th century and was originally owned by tax collector Christopher Rousby, so for years, presenters in colonial clothing at the Village told the story of the house, Rousby, and of Rousby's death at the hands of a cousin of Lord Baltimore, and they showed off a tombstone/grave belonging to Rousby that was situated behind the home. 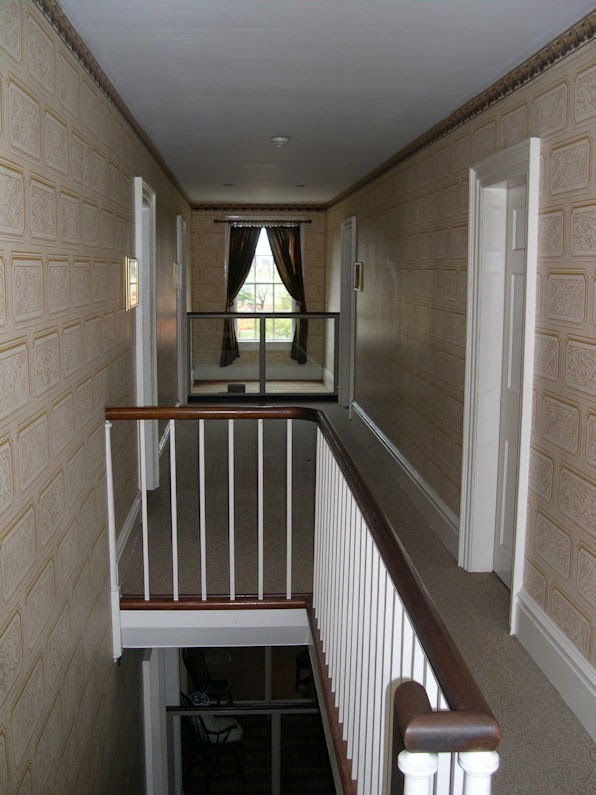 This was how the presentation of this house had been told up until the late 1980's when historians realized that this was not Christopher Rousby's house. As the Baltimore Sun newspaper article from 2005 explains: ...historians became suspicious of claims that the house dated from the late 1600s. In the 1980s, a group from St. Mary's County told museum officials that there were only two buildings from before 1700 standing in Maryland -- one in Anne Arundel County and one on the Eastern Shore. This alerted the staff at Greenfield Village that something was amiss. Again, from the Sun: Soon the staff realized there were major flaws in the story of Susquehanna. After doing tree-ring dating on the beams of the house and doing archaeological work on the home's Maryland site, it was determined the house wasn't so old. It likely dates to the 1830s. That meant it couldn't be Rousby's house. He had been dead more than 150 years when it was built. The Village staff knew they had to make changes. The tombstone was removed and put into storage and the bones were exhumed to be examined by a mortuary scientist, who found that the collection of bones were from three different people - and none were even Caucasian males! The museum received permission from the local court to have the bones cremated. They did and held a funeral as well, with the ashes reburied at Susquehanna. In 2002, a Rousby historian from Maryland named Joan Kocen was able to have the tombstone returned to its home state where she has it packed carefully away until she decides what she can do with it. No one has any idea of what became of Rousby's body. Now, how did this mix up originally occur? The Sun article states that: The tombstone, clearly dating to the 1680s, was automatically linked to the house. Oral histories perpetuated the error. The Carroll family (Henry and Elizabeth), who built the house in the 19th century, knew how old it was, but their descendants either had died or moved, leaving no link to the past. Meanwhile, a prominent historical architect of the early 20th century, Henry Chandlee Forman, helped solidify the myth when he dated the house to 1654. And because the historians of Greenfield Village, with the help of historians from St. Mary's County in Maryland, un-earthed the true history of the Susquehanna House, it can now presented more historically accurate in the year 1860. With all this talk of tombstones, bones, and parties from the past, there just has to be some very cool ghost stories about Susquehanna! 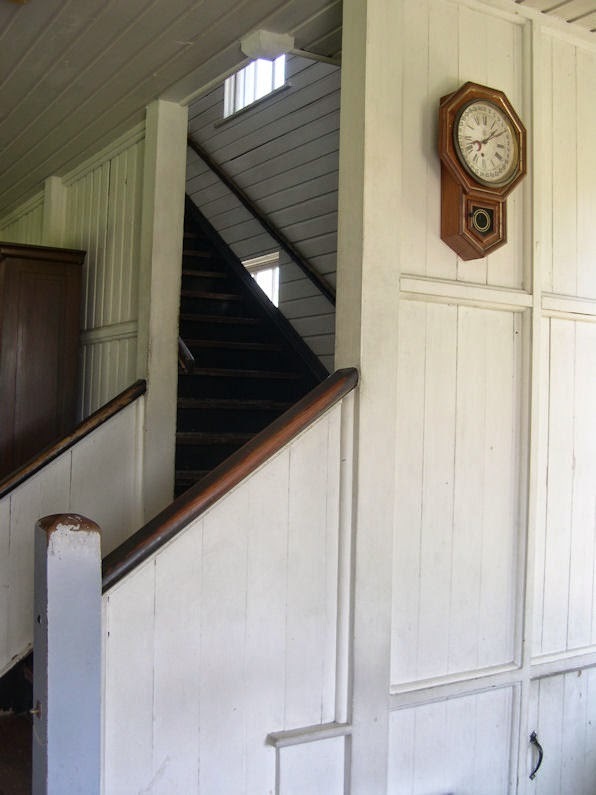 There were times I had gotten up and gone to greet the guests, knowing that there are very few places someone can go in this house, only to find myself walking the entire length of the house, to the other staircase, into the sitting room and back around, only to find no one. No children. No giggling voices. So I would go and look out the front and back doors leading outside to see if the kids might have just peeked in and ran out. Nope---no kids running here. Or are there...? Not even seeing anyone on this side of Greenfield Village, for voices to carry and children to run. It was on those days that I would return to my seat and wait. A short time later, this whole scene would play out again. Running feet. Giggles. No one there but myself. It didn’t bother me. Those were happy sounds and if the little ghosts took pleasure in making me get up and try to find them, that’s just fine. The exercise doesn’t hurt anyone. On the other hand, I have had the pleasure of hearing another sort of sound when I was alone, once more, at the end of the day when the roads are empty and no one ventures down to the house. These were the sounds of bootsteps. These boot-steps are not modern boots. I know the sounds of both; there is a very distinct difference, and working in that house, you learn them, because like the trampling of children’s feet, hearing steps on the porch let me know that someone had come to visit. The bootsteps I heard was harder, with a very distinct heel, and it doesn’t pace the front porch. I’ve only heard it on the back. Back porch of Susquehanna...where bootsteps were heard. It’s easy enough to slip out and check to ensure that no one is there, but these steps are brazen: they only wait for you to slip back inside before they start again. A steady pace up and down the back porch. And, if you are careful, you can almost hear the pause it takes for someone to turn and go back the opposite direction. I don’t know about this one; I don’t know that I would mess with this one and I would always leave it be, knowing that if I just checked to make sure it wasn’t a living person and let it go, it would go away on its own. My time at Susquehanna was an amazing experience. I hope that the kids there keep playing with those who work there." Noah Webster (1758-1843) was more than just America’s greatest lexicographer. He was also a Founding Father who helped define American culture. While teaching in Goshen, New York, in 1782, Webster became dissatisfied with text books for children that ignored the American culture, and he began his lifelong efforts to promote a distinctively American education. So, in 1783, he published the first edition of his legendary speller called The American Spelling Book, which would teach five generations of Americans how to read. The year 1812 found the Websters in a house in Amherst, Massachusetts, living largely off the income from his published schoolbooks. While there he farmed, served in the Massachusetts legislature and continued work on his dictionary. By 1822, Noah decided to move back to New Haven, Connecticut, because the Amherst house was far too cramped. He had one built to suit his needs.and chose a lot at the corner of Temple and Grove Streets as the location. This Federal-style home was originally designed and built by David Hoardley. As Noah's daughter, Eliza, wrote, "We watched the progress of the house building with interest all that year, and a glad one was the day when we moved into more commodious quarters, and your Mother and myself could have separate rooms, and Father have a nice study and conveniently arrange his books. I remember how we sat in low chairs and sewed our parlor carpets ourselves. Happy Days, sister Julia popping in and out many times each day." Not long after moving into this house, Webster decided to study abroad for a time at the great libraries in England and France, for he had exhausted the libraries of America. While he was out of the country, Noah realized the importance of describing everyday life and activities in the letters he and his family exchanged, and he especially treasured hearing of the minute details of domestic life that he missed while on far-away business travels. I am now sitting in your study, and as it is a rainy day have a prospect of a few hours uninterrupted leisure. Harriet's piana arrived in good order, and those who are Judges pronounce it a fine instrument. Martha Denison is playing on it at this very moment, so sweetly, that I can hardly sit still and write. Mrs. Steele and Eliza, and all the family, including little black Ellen, are standing round enraptured. Harriet took her first lesson today from Mrs. Salter." "I wish you could take a peep at us in the present moment, Adeline and Louisa at their usual employment, Mary sitting on the carpet by my side studying her sabbath lesson for next week (12 verses). Harriet is drilling at her music. She plays 6 tunes very Comfortably. And William driving around with his stick." "Our garden yields us excellent vegetables, beets, potatoes, peas, & beans, but the corn was planted so thickly that it will come to nothing. I examined it to-day & saw but two ears on the early corn, the later will yield better, not much however. Our vines look remarkably well and the raspberries have afforded us at least 3 quarts for a beginning." The Webster home was soon purchased and brought to Henry Ford's Greenfield Village in Dearborn, Michigan. The dismantling and restoration of this 1822 New Haven, Connecticut house in which Noah Webster wrote his dictionary provides us with a fine example of Ford chief architect Edward Cutler's technique. When Cutler had first reached New Haven in September 1936, wreckers had already demolished parts of the house. 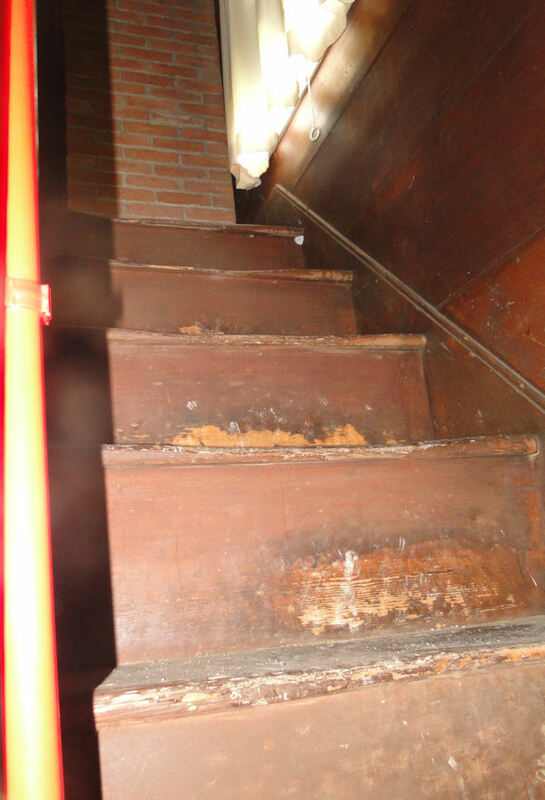 The interior was also in a poor state of repair due to the home being used as a college dorm. Once the men began the dismantling process, the house was down and packed up in two weeks. Quick but accurate. As Cutler put it, "Of course, you have to do these things right," and whenever possible, the crew removed building materials in large pieces, making reassembly easier. The structure went up in Greenfield Village during the winter of 1936-37 and soon looked much the way it did when Mr. Webster lived there. "There were a few people from Firestone Farm going for a Sunday drive in one of the buggies with a very calm team of horses. Everything was going fine and the team was doing great. When they turned down Maple Lane, the horses came to a complete stop and refused to go past the Noah Webster house. The farmer driving the buggy tried and tried and finally got the horses to move. When they were right in front of the house, they spooked, bucked, and flew past the house and down Maple Lane. There was nothing around to spook them between the house and the road." 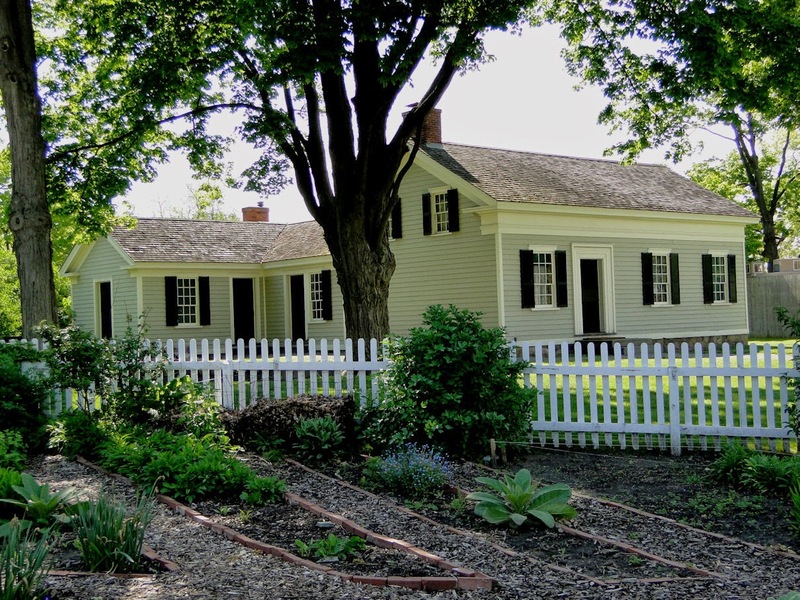 The birthplace of George Matthew Adams (1878 - 1962), the son of a Baptist minister, was built in 1833 in Saline, Michigan, and was reconstructed inside Greenfield Village in 1938. George grew up to become a well-known newspaper writer, and Henry Ford took great pleasure in the inspirational writings of his faith-oriented "Today's Talk" column. 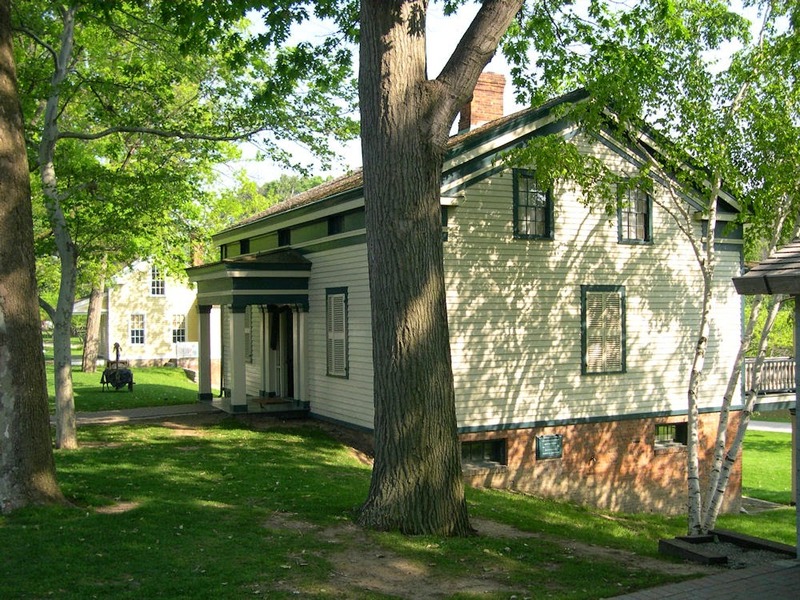 On several occasions, Adams visited Greenfield Village and stayed in his childhood home while there. Many of the furnishings are original to the home. 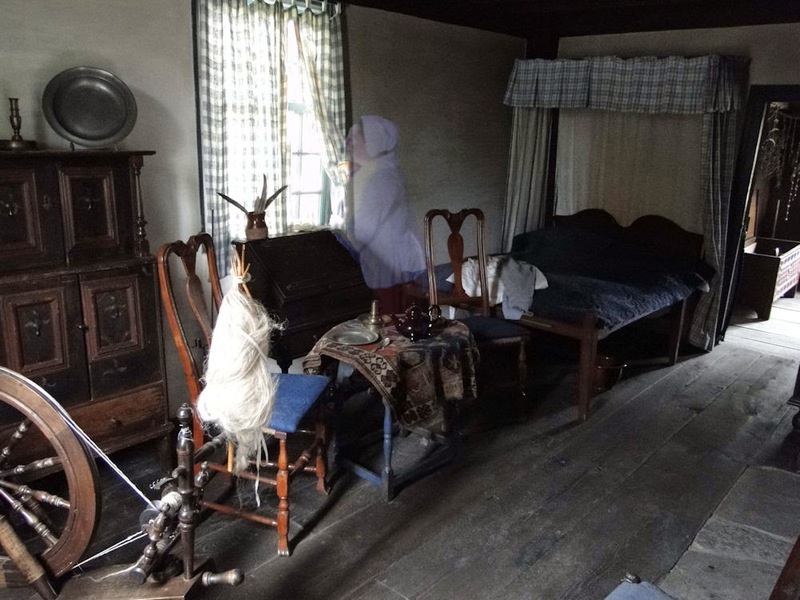 Although there are plans to revise the home's presentation to an earlier time, and is now closed to the public until that eventually happens, the home, since it was brought to the Village, has always depicted life around 1870. "It was a quiet day and I was by myself in the Adams House doing some cooking in the kitchen. I heard the sound of someone running up the sidewalk to the front of the house and their loud heavy footsteps on the wooden front porch. They came inside the house and ran right up the stairs to the second floor really quickly. The second floor is not open to the public and someone must have left the rope down that crossed the steps which is supposed to hinder anyone from going up. I ran from the kitchen to tell them to come down. As fast as I heard those footsteps run into the house and up the stairs, there was no way they could have stopped to unhook the rope. 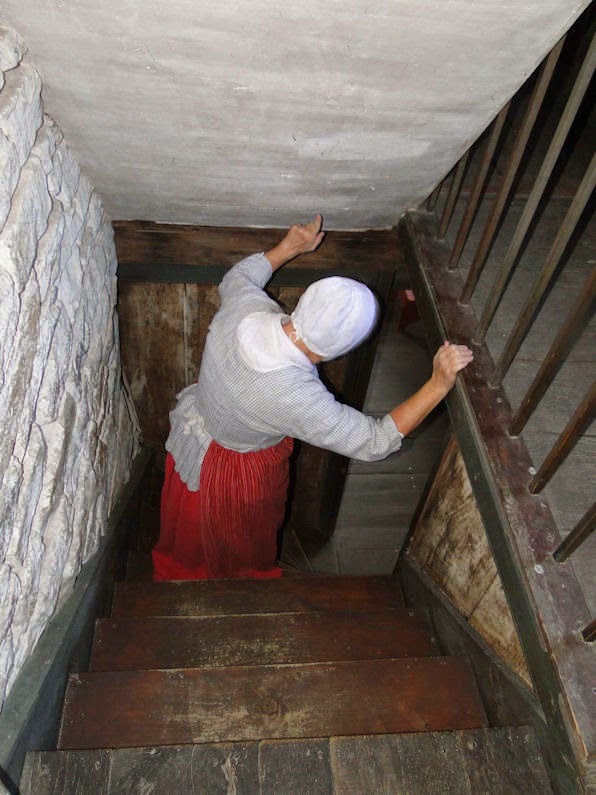 When I came around to the stairs, the rope was still hooked and there was no one upstairs." Who ran up these stairs? Hey! Come down...wait...there's no one there...what the...? The 1816 home of Thomas Edison's grandfather (additions to the home added in later years). When the grandfather of Thomas Edison led his family into Upper Canada in 1811, he settled in Vienna, Ontario, near the shore of Lake Erie. In 1816, their log cabin was replaced by this homestead, the first and for many years the only frame structure in that region. 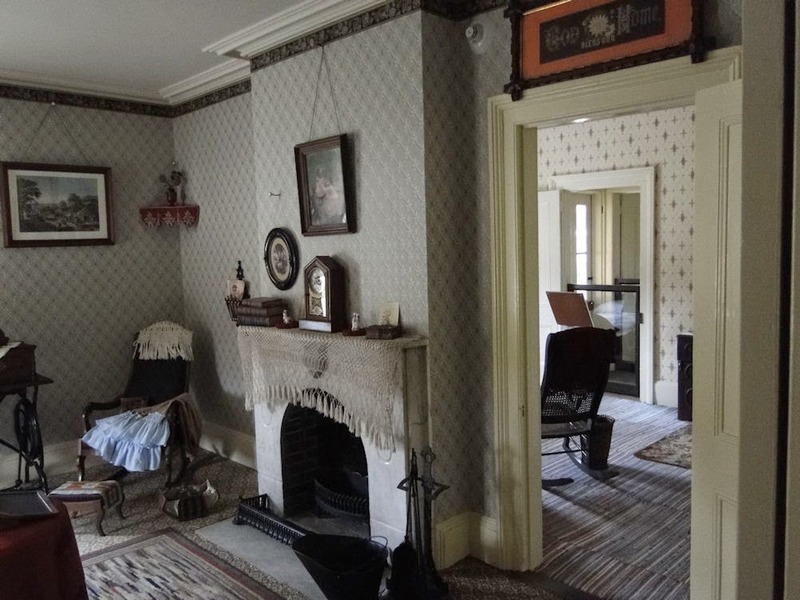 In this home, the father of the great inventor, Samuel, grew to manhood, and married Nancy Elliot, the village school teacher, in the Sunday parlor in 1828. When his arrest was sought because of his participation in the political rebellion of 1837, the house was ransacked by the military. By that time, Samuel Edison had fled to the United States. Young Tom had returned to his ancestral home over many summers and fondly recalled the large, simple, farm-type kitchen. It was moved to Greenfield Village in 1933. The folks at Greenfield Village show this house as it looked in 1915 - 99 years after it was originally built. "I don’t know well with electromagnetic fields. It’s a proven, scientific thing. I follow the typical symptoms and it messes with my balance, making me feel like I’m on a boat. I found this out at the Louvre, which is heavily outfitted with electric security (other museums with this level mess with me as well, but now that I am aware, I can adjust to it). The Edison Homestead has no reason to make these symptoms that I’ve come to recognize suddenly occur, and yet, they do. There is a spot in front of the mantel that I discovered, made me feel that way. I’d walk into this spot and I’d feel like I was on a boat, ready to tip over But when I step back, I am perfectly fine and balanced. I toyed with this for some time before I mentioned it to a co-worker and friend. She expressed feeling something strange there as well. Now, feelings are feelings and easily dismissed, so we decided, given the slow, rainy day, to explore this further. I had never ventured upstairs in this house before that time and, given how slow and dreadfully ugly the weather was, figured it would be safe to peek up and see this beautiful home so that I could adequately explain to visitors what was up there. It was also to explore these weird feelings. The stairs are dreadfully tight and unforgiving for someone like myself but I had climbed into the Blarney Castle (the stairs are a danger and tight there) without much problem. But halfway up into the Edison landing, I stopped. I physically felt that if I continued, I would tumble backwards down the steps (only about four and not enough to seriously injure me). It took several times before I could walk up there and explore this gem. Afterward, as the day went on and things needed to be put away, I was in the rooms off to the side that we use for storage now, and peeked out the window to catch a glimpse of a person - a man, to be exact. I hurried out the door and let my co-worker know. We went about the house, peeked out into the rain and saw no one even near the house. Strange that in the falling rain this man did not have an umbrella. A short while later, a shadowy figure moved, or flashed, across the room and out of it. I’m skeptical of shadow figures myself, but this was an awfully strange flash of shadow to pass across a house that was shrouded in a rainy day. Either way, once that shadow flashed, the house felt different. Empty. Normal. I could stand in that spot without feeling off balanced. I hope that my exploration of Edison (which became my favorite home) and my finding the ghost there has helped it to find peace." This house, built in 1870, originally stood near the laboratory where Thomas Edison and his men toiled in Menlo Park, New Jersey. 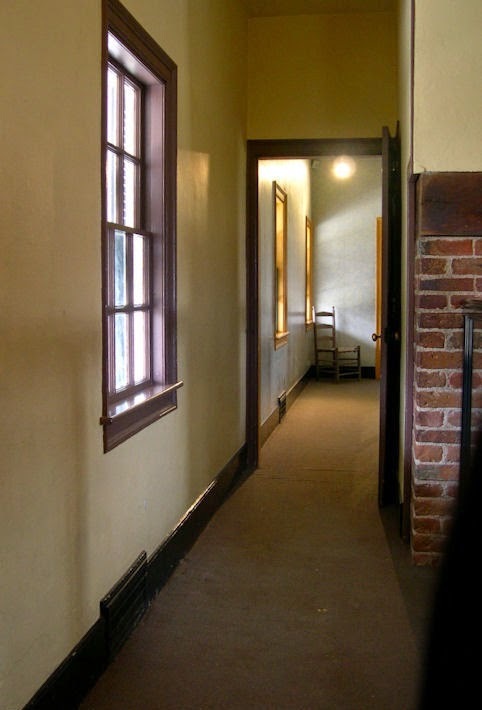 Widowed in 1877, "Aunt Sally," as Sarah was known, lived in Newark, and was sent for in 1878 by her distant relative, Thomas Edison, to run a place for his workers to eat and sleep. With little employment opportunities for women, Mrs. Jordan accepted the offer and opened the home as a boarding house that same year. 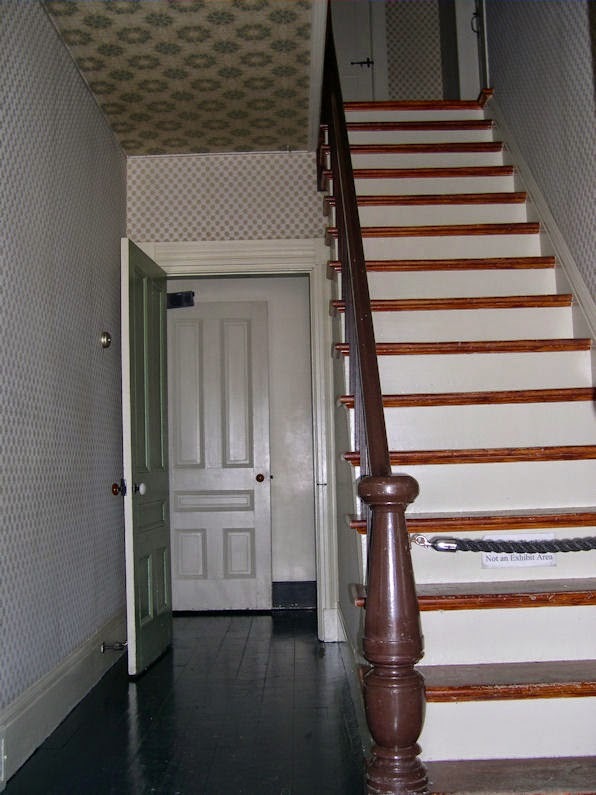 While her boarders slept upstairs, Sarah, her daughter, Ida, and a domestic servant named Kate Williams slept in bedrooms on the main floor. There was a sitting room for the men as well, separate from the women, where they could play cards, smoke, maybe have a drink, and enjoy conversation that sometimes could've been objectionable for feminine ears. Mrs. Jordan also made extra money by opening up a portion of this house as a lunch room, feeding hungry travelers who happened by. Of course, they would eat on the boarder side of the house, except when there were a great many that showed. One can just imagine the bustling of activity that took place here; cooking, cleaning, washing, and mending endlessly, for Mrs. Jordan cleaned up after these Edison workers besides cooking their meals. 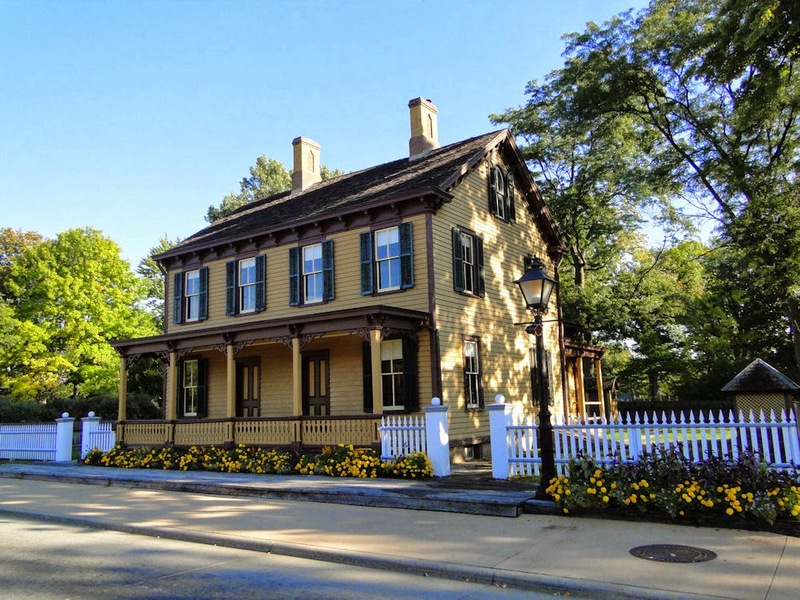 This house has the distinction of being one of the first (if not the first) home in the world to be lighted by Edison's newly perfected electrical system and incandescent light bulb. This took place on December 31st, 1879; after years of work and thousands of experiments, Edison finally was able to give the first public demonstration of the incandescent light bulb. When it was brought to Greenfield Village with the other Edison buildings in 1929. 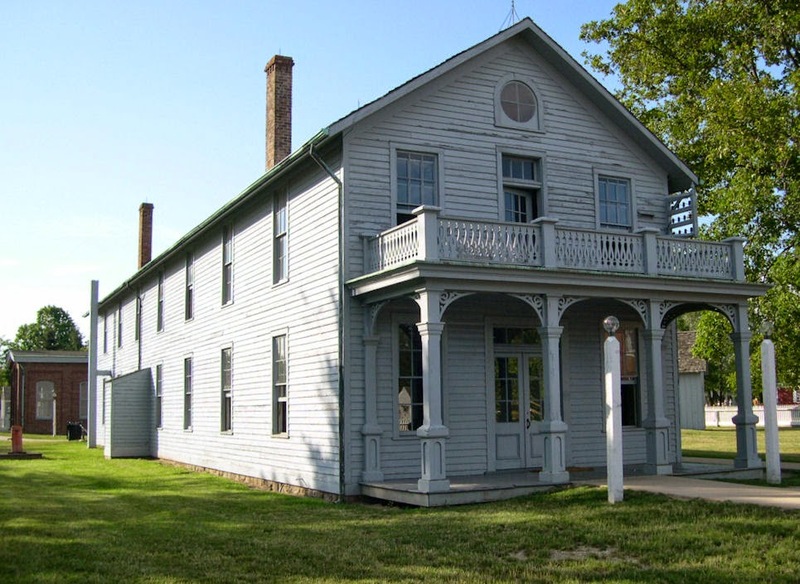 Mrs. Jordan's boarding house was placed in the Village in the same proximity as to where it originally stood with the buildings in which Edison worked. Sarah's daughter, Ida Jordan Day, donated (or sold to Mr. Ford) many original furnishings and pieces that belonged to the Jordan family. She also arranged the pieces in the way she remembered them as a teenager back in Menlo Park. "My story deals with the Boarding House. it was late in the day and I was getting ready to lock up for the night when I heard the mantel clock chime on Sara's Jordan's side of the home. The clock rests on the fireplace more for decoration because it doesn't work. I didn't think much of the chiming so I locked up the house - at that time we had to lock and unlock both the Burbank office and the Ft. Myers lab. As I was coming back from taking care of that, something caught my eye on the third floor window of the duplex, which is locked and off limits. A man with a dark beard, white shirt, and red suspenders was staring down at me. I don't see anythi------hold on a sec! 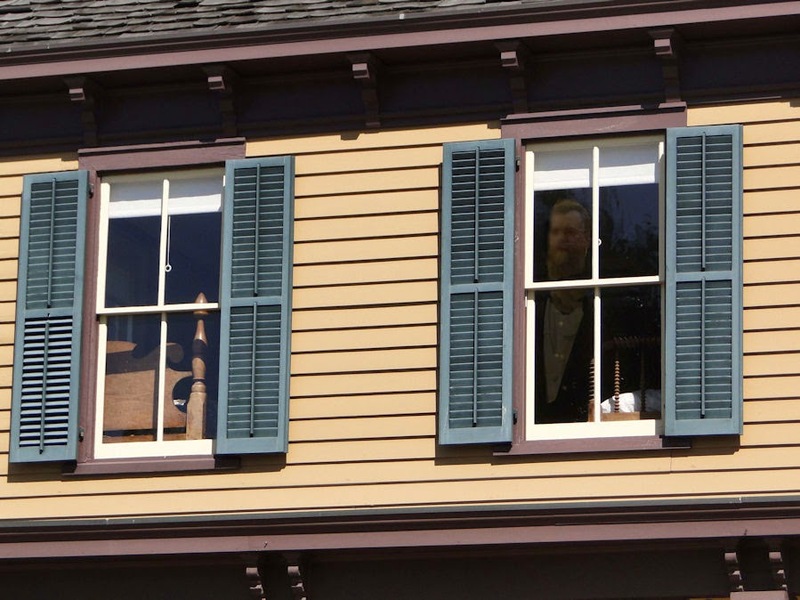 What or who is that in the window?? Then he faded away. I went back into the house thinking it was a visitor but the door to the 3rd floor was locked and I didn't have a key." In March of 1928, Ford began the restoration process. He wanted to reconstruct the Menlo Park complex where Edison and his skilled helpers worked at inventing "the future" from the years 1876 to 1886, and he wanted to do it in every minute detail. It was unfortunate that the original site was nearly completely dismantled by neighboring farmers not too many years after Edison's move to West Orange, New Jersey in 1887. In fact, it was only a year after Edison had removed himself cows began to wander amongst the buildings of the complex, and a chicken farmer even allowed his flock to make the laboratory their home! Soon after, many local residents began using the quickly dilapidating building's boards to repair their own deteriorating barns and hen houses. A severe storm blew what was left of the building over in 1913. 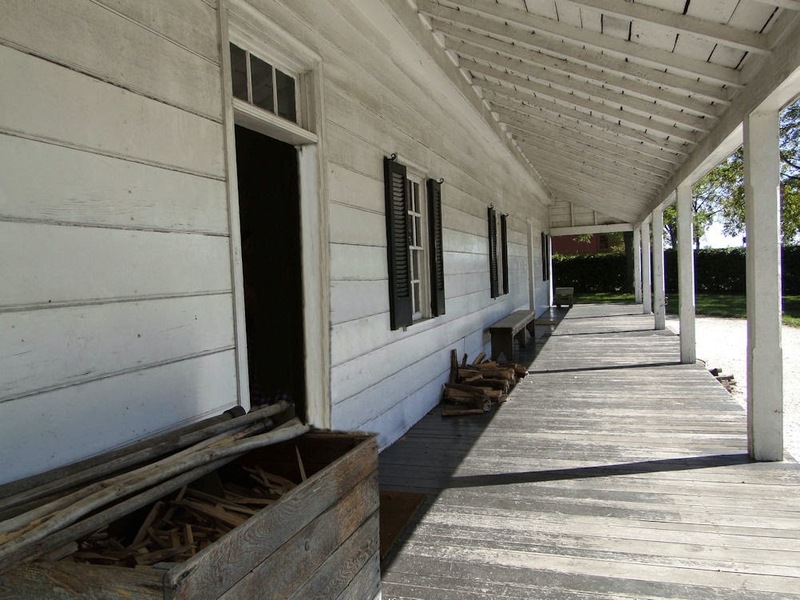 Luckily, with Mr. Edison's help, many of the original boards were found, including some that were in storage, while others were regained through purchase of the sheds and other farm buildings mentioned above. Edison himself supervised the reconstruction. "It was a raining cold day, and I was working at the Menlo Park main building. It was myself and another presenter. We were sitting there and, because of the rainy weather, didn't see a visitor all day. It was about 4pm when we both heard the door open near the assay room and then close shut. We then heard footfalls on the floor coming towards us. The sound then went up the stairs to the lab. We both witnessed this and still talk about to this day." "We then heard footfalls on the floor coming towards us. The sound then went up the stairs to the lab." The Firestone Farm was originally built by Peter Firestone in 1828 in Columbiana, Ohio (just a few miles from the Pennsylvania border), and is now a gem among gems inside Greenfield Village. Among the family members living there in the latter half of the 19th century was young Harvey Firestone, the grandson of Peter, who would later gain fame and fortune in the tire industry and became a close friend of Henry Ford. During the 19th and into the 20th century, the Firestones raised a large flock of sheep, with wool being their 'cash crop,' but they also harvested oats, hay, corn, and wheat. 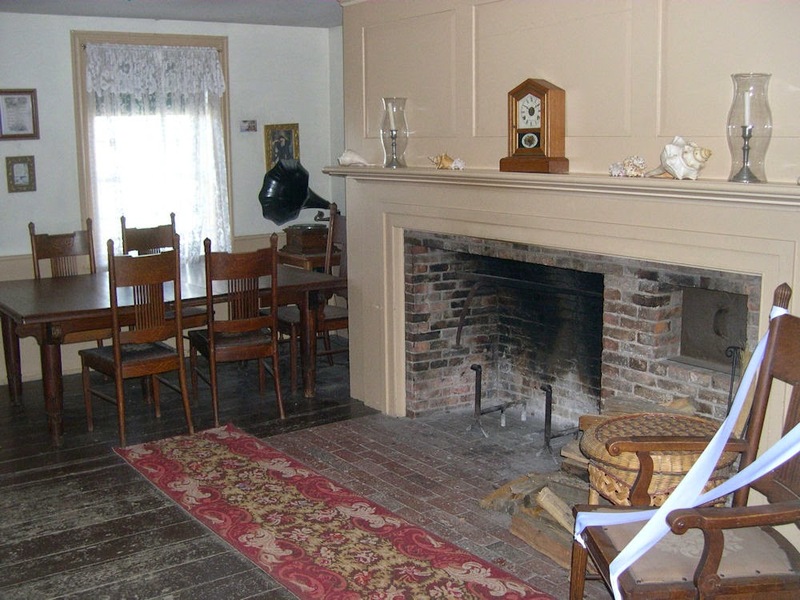 In 1965, nearly thirty years after Harvey's death, his descendants and the local historical society restored the house and opened it to the public for tours, but because of the farm's remote location, it failed to attract many visitors. In 1983, Harvey's two surviving sons, both in their 70's, gave the house and barn, together with furnishings and a sizable endowment for maintenance, to Greenfield Village as a way to keep the memory of their father. Disassembling the buildings and reconstructing them some two hundred miles away took over two years. During the dis-assembly and reconstruction, however, the crew made a very interesting discovery: a note tucked beneath a staircase, signed, dated, and hidden by none other than 14 year old Harvey himself, inadvertently revealed the date of the 1882 restoration! The Firestone Farm, as it stands now in Greenfield Village, is a living history re-creation of life on a farm of the 1880's in Eastern Ohio, and has been restored to look as it did in 1882, when Harvey's parents remodeled the house to give it a more modern look. 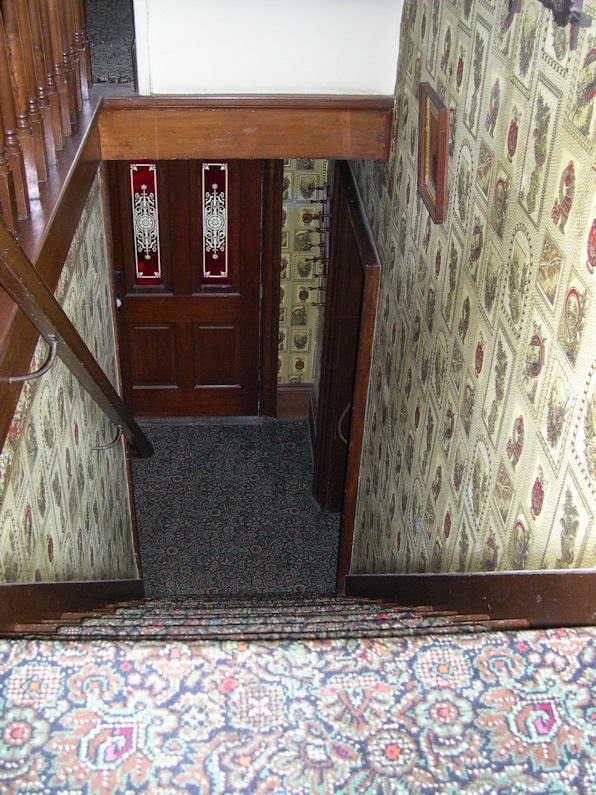 The wallpaper and furnishings throughout the house show what was considered stylish during the Victorian era. The curators went to the extreme to perfect this 'experience.' Their methodology was to decide, as accurately as possible, what the Firestone family would have had or would have done. They focused on the people from 1880's eastern Ohio, then 1880's midwest, then 1880's north, etc., until they were satisfied that they had re-created life as once lived. The Firestone Farm and barn truly make for an authentic living history experience. One can spend hours watching and speaking to the presenters. It's probably the most "living" part of the entire historic complex. But not everything at the farm is living, as you shall find. "I took to humming or talking to myself as I opened the Firestone Farm house in the morning, but then I would hear something I didn’t want to. Often there are thumps in that house. One particular event happened when the house was just about to open and I was tending downstairs while a couple other ladies were up in the attic on the third floor. I heard a loud crash and I hurried to the stairs, thinking that they had tripped coming down. I called up to see if they were alright and they called down to ask the same of me. We met at the stairs and realized that the thump had come from the second floor. Whether this was to get our attention or as a warning, I can’t be sure. I know that we refer to whatever it is as ‘Sally’ but there are times when the sounds, the weird shifts in things, don’t feel quite so welcoming, and I do believe that Sally would have been more welcoming." But we didn't see a thing! "A number of years ago I was at Firestone in the fall at the end of the day working with another staff member to finish dishes and clean the kitchen. I was standing by the back porch door when I thought I heard her drop one of the metal plates onto the floor. I turned to see if she was alright when I noticed she was staring at the stove. I asked if she was o.k. but she just pointed towards the stove and we both noticed that the metal drying rod was bouncing behind it. Neither of us had been by the stove for a while since it was cooling off before the end of the day. We'd had no visitors for at least an hour (it was a cool, rainy day), and we were using the towels that normally sat on the rack. Pulling the towels off the metal rod pockmarked the walls and rarely resulted in it bouncing. In the nearly ten years I worked there, and countless times I was in that kitchen as the metal of the stove heated up and cooled down, it never happened before. We couldn't figure out what made that rod pick up and drop by itself, and we stood there dumbfounded and watched it bounce until it stopped. Very weird and cool at the same time. I tried jumping on the floor and walking by the door to see if that would cause anything, which it did not, and my coworker was sufficiently spooked and wanted to leave pretty quick. I wanted it to happen again so I could test other theories. Still odd. It was the only thing witnessed by someone else that otherwise I would have questioned my sanity." "The only experience I've ever had was one day at Firestone, I was in the kitchen standing over by the sink. We were cleaning up, when all of a sudden, we heard this loud clang over by the stove. We looked over and saw the rod used for drying flipp forward off the wall, hanging free. No one was over by the stove and there was no way that the wind could have flipped that steel rod like it was. We ladies looked at each other and then I walked over and put the rod back in place and we went about our business. That is the only experience I've had besides seeing things out of the corner of my eye or hearing rocking chairs rock upstairs late at night." This same presenter told to me a story about hearing the creaking of the rocking chair in "grandma's room" on the second floor while everyone was all downstairs. "The rocking chair thing happened while a few of us were staying late at the farm during lambing season. We were just sitting in the house while it's all dark and creepy and we heard the rocking chair upstairs start rocking." You see it? It's there on the left. Is this the chair they heard while no one was up stairs...? This is not the first presenter to tell me the rocking chair story. In fact, a number of presenters have also mentioned hearing footsteps on the 2nd floor of Firestone while others said they heard women's voices in the kitchen when no one was there. Like the rocking chair story, the narrative of hearing women's voices has been told to me a few times from different presenters over the years. 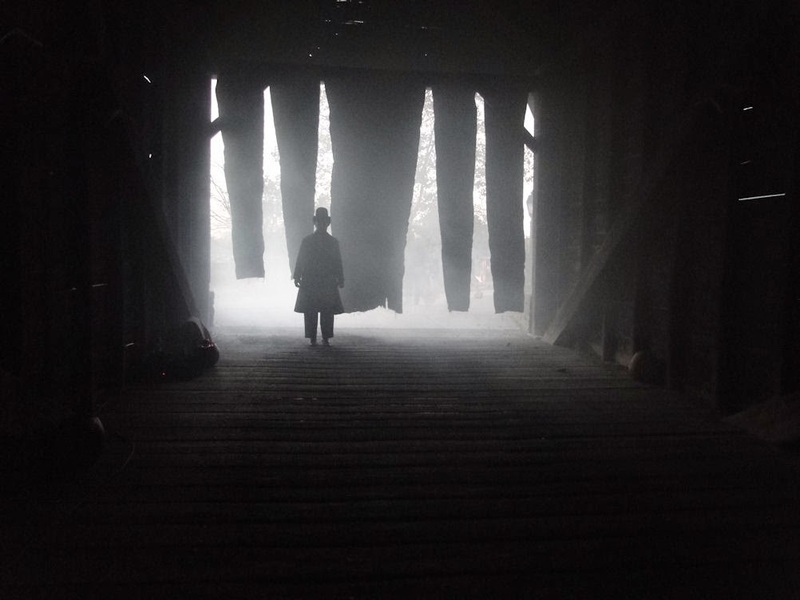 I was also told of hearing heavy footsteps on the 2nd story of the barn well after closing time. ...Or is this the chair that was heard? Either way, this is the room from which the presenter heard voices. Would you spend the night in here...alone? 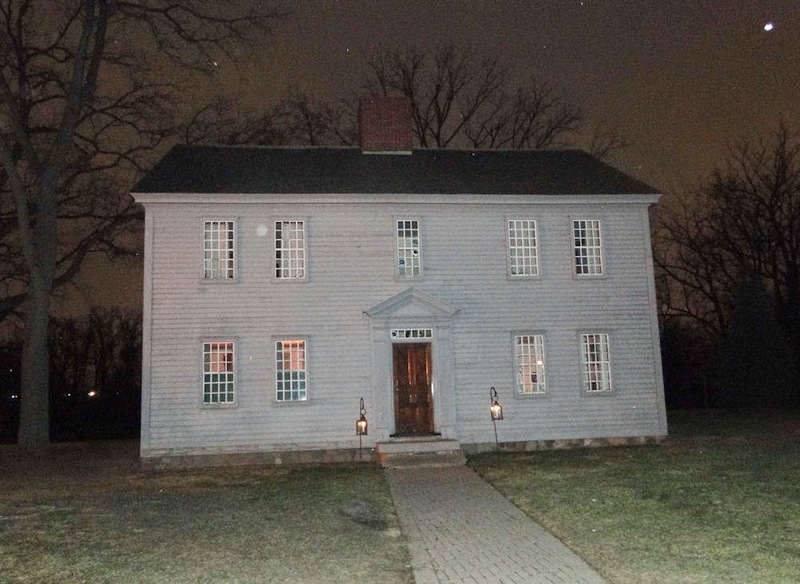 In the 18th century, Andover, Connecticut was known as Coventry, and it was in this village of Coventry that Samuel Daggett (1723-1798) built the saltbox structure sometime between 1746, when 40 acres of land was deeded to him by his father, and 1758, the year he married his wife, Anna Bushnell. Daggett was a housewright by trade and built this particular home on Shoddy Hill Road. Samuel Daggett also worked the family farm and grew many different crops and raised several types of animals on his farm, for his family's use or to sell or trade for other things the family needed. One would think that would be enough to keep the man plenty busy, but, in order to provide for his family, Daggett also had additional sources of income, including making furniture; he made chairs, spinning wheels and even coffins. Surprisingly, we find that he pulled aching teeth for his neighbors, a skill he learned from his father. The home life and daily activities of Anna and the children (Asenath, Tabitha, Isaiah) were closely connected to the work that Samuel Daggett did. On farms in the colonial era, each family member played an important role in producing food, clothing and household goods for the family. Anna Daggett ran the home and cared for the family. 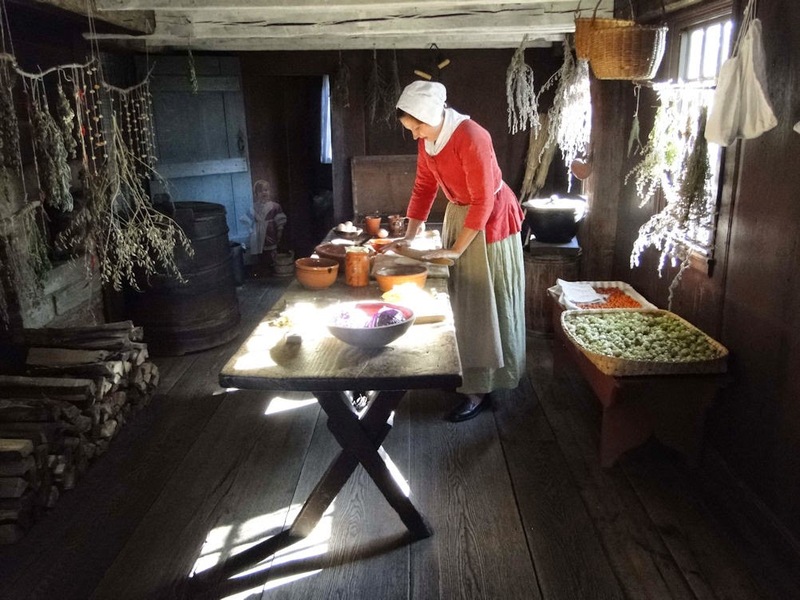 She prepared and preserved food; spun yarn; made clothing, towels and sheets; gave the children their earliest lessons in reading and writing; and fed animals like chickens and pigs. Restoration specialists George Watson and Donald Graham watched carefully as the Edison Institute crew painstakingly dismantled the house and reconstructed the numbered pieces at the far-end of the Village. It was ready for public viewing by the 1978 season. With this wonderful New England addition in its new location situated near the Plympton House, Giddings House, the Farris Windmill, and the English Cotswold Cottage and Forge, the colonial section of the Village was now complete. Greenfield Village uses the house in a very effective manner: employing living history, the docents are dressed in accurate period clothing of the mid-1700's, and they work the house seasonally as if they truly lived there 260 years ago. 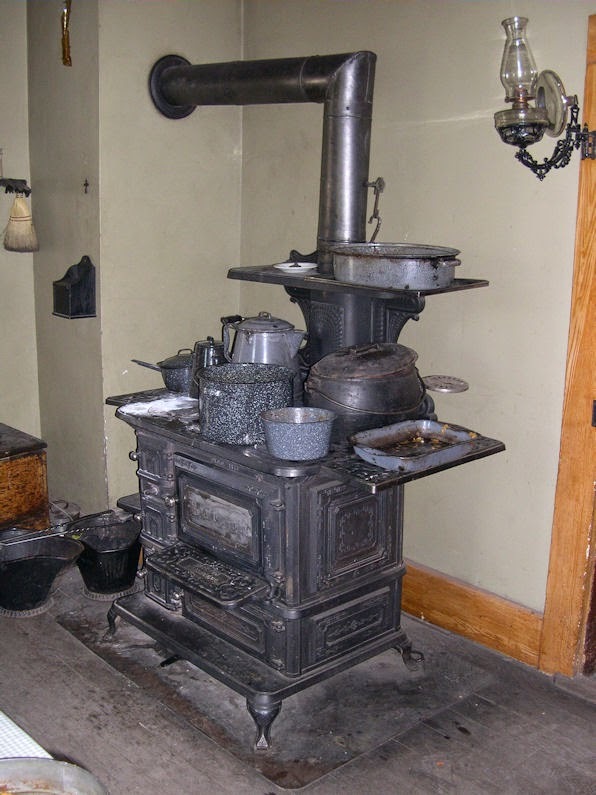 However, rather than portray a 1st person presentation, such as Plimouth Plantation in Massachusetts, these presenters remain in 3rd person, teaching the visitor the everyday life of colonial New England by ‘show and tell,’ including the preparation and cooking over a hearth of daily meals, dyeing wool and spinning said wool into yarn by use of a great (or walking) spinning wheel, weaving, gardening, chopping wood, and more. With a house this old, there just has to be some strange other-wordly happening. My friends did not let me down. "One of the ladies had to go upstairs to the second floor to get something. As she was coming down she tripped on her long pettticoat. She began falling down the steep stairs but suddenly felt someone catch her and pull her back up. She was convinced it was Samuel Daggett." "My stories of Daggett are a bit more mundane as far as haunting. I’ve never had the pleasure of seeing ‘Samuel Daggett’ - perhaps he has left, I don’t know. I know that I have been in the house, all closed up from the wind, and the ropes inside have swung or a feeling is there that you are being watched, like a teacher watches their students." And yet another presenter told me about a man who, for a short time, lived with Samuel & Anna Daggett and their family. It is thought that he may have been a hired hand. It was late in the day, and one of our presenters, who we'll call presenter number one, was sitting by herself in the great hall, which is the main room inside the house. There were no visitors around and the other presenter (presenter two) was out in the garden. As presenter one sat by herself at the table near the window, she heard presenter two unmistakeably walk into the kitchen and head back to the entrance of the formal parlor. A few minutes later, presenter two came in again from the outside...from the very same door she came in just a few minutes before. "I thought that was you in the parlor," the first presenter mentioned. "No," replied presenter two, "I just now came in." That's when presenter one was told about this unknown man who stayed with the Daggett's back in the 18th century, and it was suspected these footsteps that were heard were from him. He always walks into the parlor, to the window, and then to the door. He always remains in the parlor. She also mentioned that this mystery man appears as an apparition in a photograph standing directly behind her as she spun flax on the spinning wheel in the parlor. She mentioned to me that she knows the person who has this photo and hopes to get a copy so I can post it here. In the formal parlor looking for the hired man. Presenter two then asked if the day's items they had used were put away and locked up in a store room upstairs. Presenter number one assured number two that, yes, in fact, she did take care of it. As they both went up the stairs they found the items strewn all about, and the previously locked doors now open. The presenter one, who told me this story, swears everything was put away and the doors were locked up. This same presenter regaled me with another unusual Daggett tale, this time involving a young girl. She was riding on the train with her mother and father when, as they passed the Daggett house, she began to cry and said she wanted to go to that house. Well, the next stop for the train was clear on the other side of the Village, and the young girl, as the family exited the train, continued crying, pulling her parents on foot back to the Daggett home. When she finally reached the old saltbox house, the little girl, still crying, walked inside and exclaimed that she was Anna and she used to live in this house. The presenter told me she heard the girl's exclamation personally. Now, there is a related story I found in the Benson Ford Research Library about a young girl who, while visiting Greenfield Village with her mother and father, suddenly took off running, her surprised parents struggling to keep up. She crossed the entire Village, knowing exactly where she wanted to go. 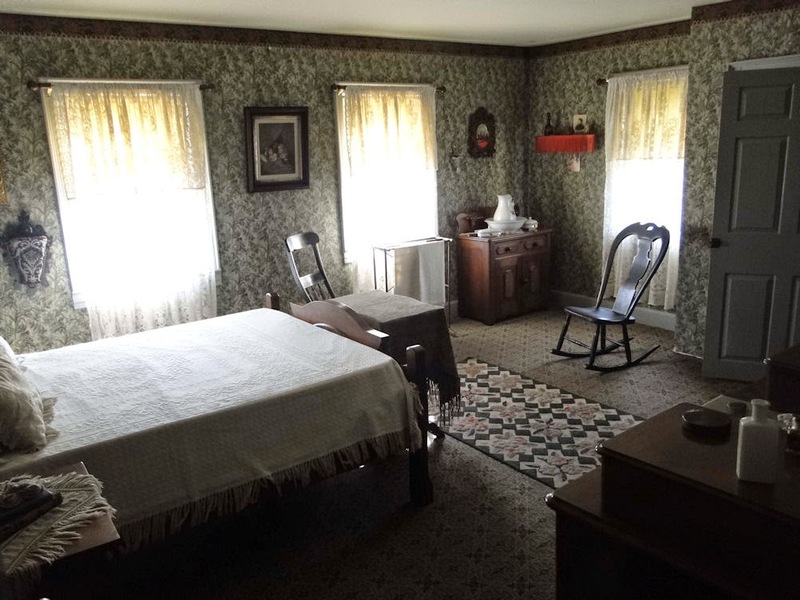 As she came upon the Daggett house, she darted in and went directly to the "artifact room" (I'm assuming the formal parlor) and, after surveying the collection, exclaimed, "Oh, good! They have the furniture arranged just as it should be!" Her parents and the building docents stood dumbfounded, for the collection of furniture was willed to The Henry Ford upon the death of an elderly woman. Her only stipulation? That the furniture be housed specifically as she wished. Could this be Mrs. Dana Wells, the woman who contributed the Daggett House and furnishings to Greenfield Village? (The furniture is now on the 2nd floor of the building, for it was not correct to the era in which the Village wished to portray). And yet here's still another Daggett story from a former presenter which tells of feeling, but not seeing, the tug of a child. This presenter was speaking with visitors at the keeping room door (to the right of the kitchen) when she felt what she thought was a child grabbing and pulling on her skirts, but as she looked around, there no child was to be found, nor had anyone around seen anything or even reacted to how she searched for her little "tugger." There's no little ghost-girl in this photo...at least, I don't think there is...but if you feel a tug on your petticoat, it's not her. "I was alone at Daggett in the back room off the kitchen where we store most of the foodstuffs and I felt a tug on the right side of my petticoat. I thought it got caught on the wood bucket that was kept in that area, but the bucket was on the other side of the room. It felt like a little kid trying to get my attention. When I walked into the kitchen I was standing looking at the table (again I was alone) and I felt someone tapping on my left shoulder. When I turned around there was no one there. A few hours later I was in the Great Hall at dinner with three other presenters, and the house lead was presenting to a group. One of the other presenters and I were sitting on the bench against the far wall. I had my hands in my lap and my co-worker was eating and I felt something caress my left hand. This all happened in one day, and it wasn't frightening - it was actually very comforting." Well, that's about all I have. 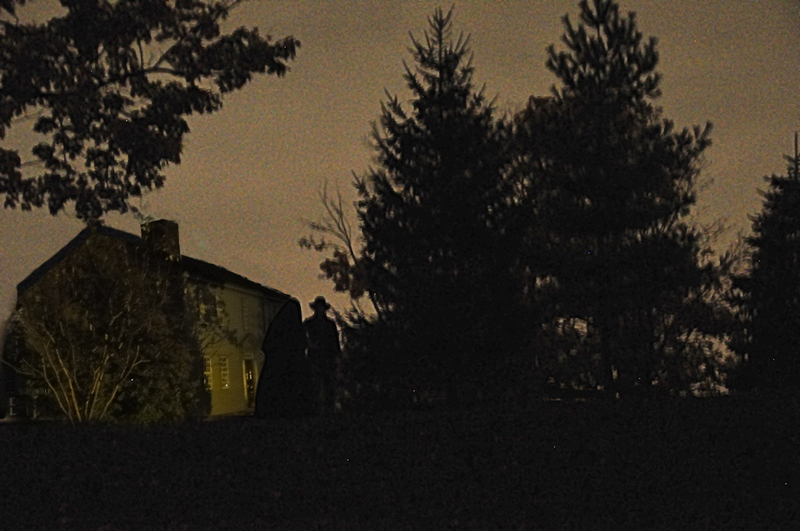 It's been said that the management prefers not to have ghost stories about Greenfield Village told to visitors. I'm not sure why. I mean, if a visitor happens to ask, and there's a story to tell, why not? 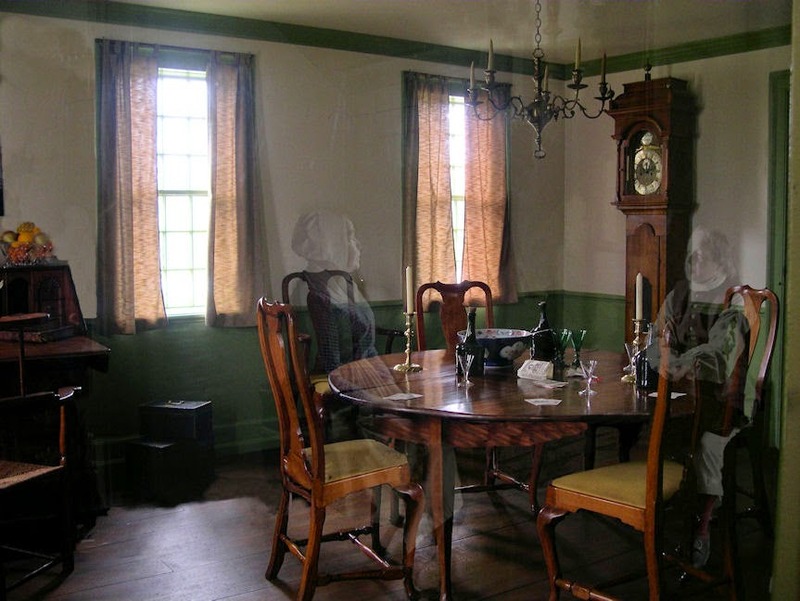 Most historical places usually have some sort of paranormal tales to tell, and some, such as Colonial Williamsburg, Historic Fort Wayne, Gettysburg, and the Holly Hotel actually have ghost tours. To me it's another way of knowing and fully understanding that, yes, people actually lived in these homes at one time, much in the same way we live in our own homes today. They were once alive and had feelings just as we do: they felt happiness, sadness, anger, pain, concern, and contentment. They celebrated the coming of spring, of harvest time, and holidays. They spoke of their crops, the weather, told stories, and studied the Bible. They discussed and probably even debated the news of the day - how wonderful it would be to be able to hear conversations and opinions about the Revolutionary War, their thoughts on the Declaration of Independence, the forming of the new nation with its own Constitution, and hearing of George Washington becoming our first president as it was happening! On an interesting sidenote is hearing that Paul Revere rode from Boston to Exeter, New Hampshire (original location of the Giddings House!) to a gathering of Whigs in January 1775! Royal Governor John Wentworth wrote, "Paul Revere went express thither yesterday noon. It portends a storm rather than peace." I wonder if this was mentioned inside the Giddings home? 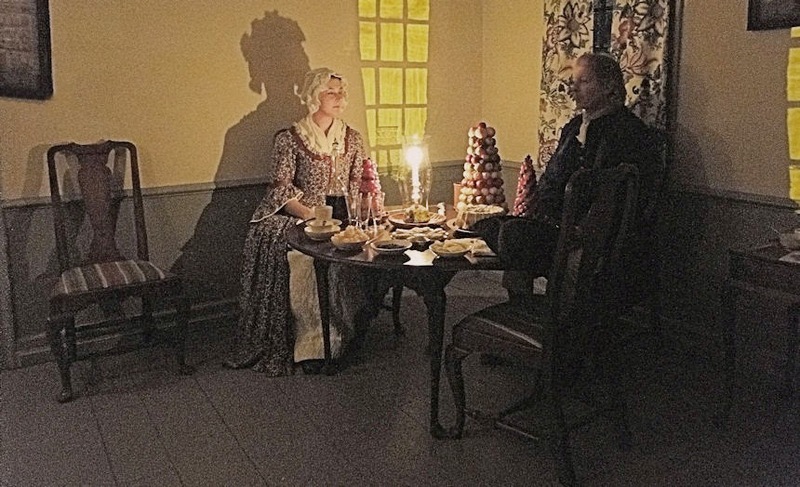 Just imagine...I mean, if the Giddings and Daggett house walls had ears, they most certainly would have heard at least some talk about these great events. Maybe a few of the spiritual inhabitants took part in these long ago conversations, who knows? "Mehetable! 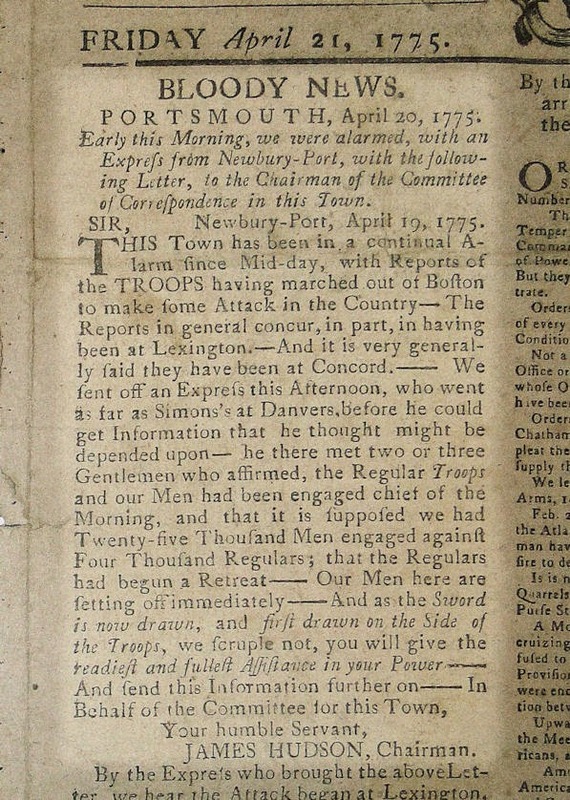 Have you heard of this raucous occurring in Lexington and Concord?" "Aye, husband. I fear troubled times are nye." That thought right there just sends chills - - but in a good way! Why there are spirits that still walk the earth is a wonder, but, personally, I think it's pretty cool, for, as I said, it reminds us that these museum houses were once alive with people...families. I also believe stories like the ghost stories you just read add to the mystique of the structures. I would like to thank the many former presenters who gave me their supernatural stories. I purposely did not give out any names for differing reasons. Liked the read & the history with the stories. While I wouldn't mind hearing the stories at times I can completely understand why GFV management shy away from it all. I will take heat for this but as a broad statement "ghost hunters" are not always the most respectful. Biggest case in point are the 1000's that trespass on National Park land to ghost hunt even if it is illegal. I have slept on the battlefield at Gettysburg (with permission) a few times. The amount of camera flashes I see in the distance and more was surprising. Also was awaken by a ranger kicking a large group of hunter or trespassers out one night. Ghost hunts are saving some of our history with the $ they bring which can be ok. Glad THF isn't and understand why. Being that GFV is more of a controlled site, I don't believe they would have the problems other, more open, places would have. Considering that they're locked up tight overnight, they most likely would not have that sort of problem. I so enjoyed hearing the stories and history while seeing the corresponding home or building to go along with the story. That village is totally amazing, so many homes. That's so nice that you get to go in all of them. 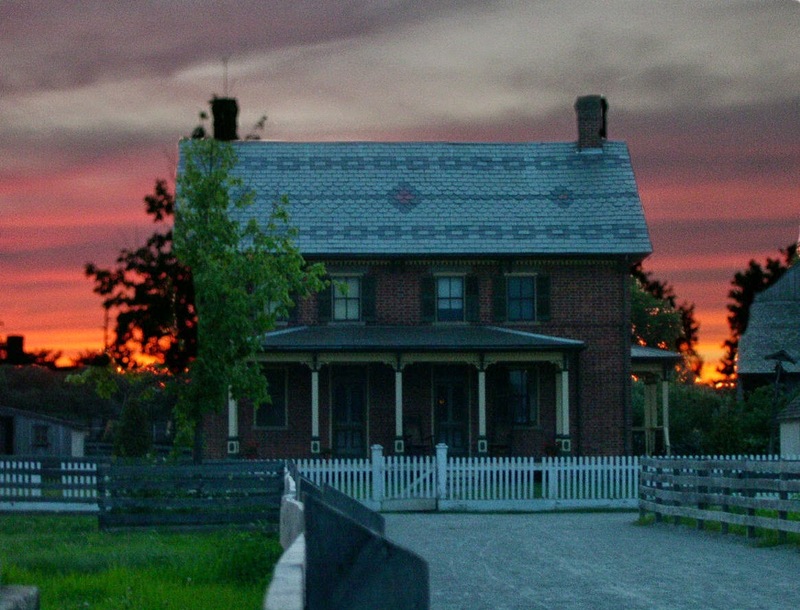 That sunset picture of Firestone Farm is stunning as well as the wonderful interior views. Again, I loved this post. Thanks so much for sharing with us. I thought about waiting until Hallowe'en but that's such a long way off - I couldn't wait!! Thanks so much for the kind words - I very much appreciate it! I very much appreciate your comments about this post and my blog in general. Such fun reading! As a New Englander and resident of very old houses, I, too, have experienced lots of "that kind" of activity and none of it was ever threatening. I also think that many more people than we realize have experienced "spirits" and just don't talk about it, at least not to a great extent. Proof of the pudding, in lots of old towns and cities on the east coast, a great tourist favorite are the "ghost tours" which take you on foot around the place and show you where there has been ghost sitings. Such fun! What a great article. So very interesting! Ken, Thank you so much for telling me about this. I enjoyed your photos and your stories Since my cousin worked there for years and has recently told me a little about her experiences, I was especially interested. I really enjoyed reading this. I am a former THF employee (I was a presenter in Main Street). I never had any paranormal experiences myself, but knew others who did. Like you, I never understood why management discouraged any discussion of it. These stories just add more depth the the character of the buildings. Thanks again for the read. I love good ghost stories! Well written and informative! I am not a ghost or spirit believe, too much of a realist. I have worked in historic buildings and collections (even with coffins)and have never felt a presence and never will. 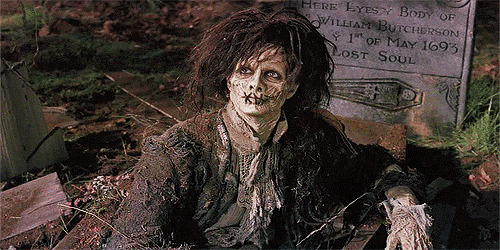 Once the dead is dead they are gone to the afterlife to stay. As a Christian I believe in angels to a certain extent. Anyhow and beside the point, I have friends in the business who do believe in ghosts and if they want to share their experiences with the public I say go ahead! The public loves those kind of stories. Many a visitor has come up to me for ghost stories and I disappoint them unfortunately. An interesting read! Are the ghosts in the photos real? Curious that management discourages ghost talk now. I remember in the late 90's, early 00's there were classes and special offerings for members. One of these was an after hours "ghost tour". I always wanted to take that one, but these classes ended before I ever got around to it (or had the money to do it).